Amy Adams plays a linguist brought in by the military when 12 space ships land on earth and contact is made. How can we communicate with them? What do they want? Should we simply just destroy them? Heady science fiction tale with the added element of a personal drama laid over it is one of the best science fiction films in years. Rarely has any science fiction film, especially one from the United Stated been so moving on both an intellectual and emotional level. I dare you to see this film and not be thinking about it for days afterward. I also dare you not to have a tear or two rolling down your cheek at its conclusion. 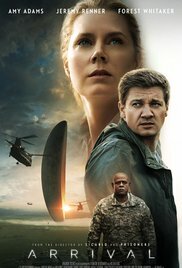 ARRIVAL is not going to get a long review or deep discussion from me at this point. While I highly recommend the film it is nigh impossible to discuss the intricacies of the film without revealing too much. What is going on and what we are seeing are revelations best discussed once more people have had a chance to see it. This is a review not a discussion and I would be doing a grave disservice to you and the film. While have no qualm calling it one of the better films of the year, and while I know I will be thinking and pondering the film for a long while more, I am uncertain about what I feel about the film past certain point. Yes, the end had me tearing and I was moved deeply but little details in the plot, which I can't explain without ruining things, keep me from giving myself over to it completely. Though I think it will help if you realize the film is Amy Adams story not the aliens. That said I can't wait to dive in again. I've already had one killer discussion with Huber Vigilla about the film and most of the audience at the theater I attended stopped in the lobby and was discussing the film in a very animated and excited manner. I haven't seen that in a non festival/non press screening environment in years. Highly recommended for anyone who wants a good film, especially one that is much more intelligent than 95% of American films.